Did you know Oreos celebrate their 100th birthday on Tuesday? No? Me neither. I found out while watching CBS Sunday Morning in my PJs over the weekend. What I do know is that I love Oreos. I can’t remember ever not knowing and loving Oreos. I am first and foremost a chewy cookie lover, so it’s really saying something when I say Oreos are a favorite. Other childhood favorites have fallen out of favor with me over the years (I’m looking at you, Girl Scout cookies) but not the Oreo. I found myself craving cookies and cream last week, so I immediately hit the store for a package of Oreos. It’s hard not to love a smooth creamy filling and crunchy chocolate cookies, right? To get the best creamy to crunchy ratio, I decided to make tarts. Tart shells made of crushed Oreos, a creamy yogurt and cream cheese filling with more cookies, plus a few crushed cookies and a drizzle of chocolate on top. I’m not going to lie – these Oreo Cookies and Cream Tartlets are as decadent as they are delightful. If you have a food processor they’ll come together very quickly. I love that they’re both slightly fancy and nostalgic. Sweet without being too sweet, these tarts taste something like an Oreo cheesecake. It’s my new favorite way to enjoy an old favorite. PS. Did you see the big news? The Craving Chronicles now has a Facebook page! I didn’t add any sugar to the filling because I didn’t think it needed any. I liked the contrast of the barely-sweet filling and sweet toppings, but if you think you might want it sweeter, add sugar to taste. I don’t recommend refrigerating the tarts for more than 4 hours as the cookies lose their crunch in the fridge. Preheat oven to 350°F. Using baking spray, lightly coat 4 4-inch tart pans with removable bottoms. Set prepared tart pans on a baking sheet. Add 15 Oreos to food processor and pulse until reduced to fine crumbs. With the food processor running, pour in melted butter. Pulse until it reaches the consistency of wet sand, scraping down sides if needed. Divide crumb mixture evenly among pans, about 3 tablespoons in each. Using the bottom of a measuring cup or glass, press crumbs firmly into tart pans to form a crust. Bake for 5 minutes at 350°F. Set aside to cool. Meanwhile, add 6 more Oreos to food processor and pulse until roughly chopped. Add cream cheese, yogurt and vanilla. Continue pulsing until combined, scraping down sides if needed. Divide filling evenly among cooled tart shells. Just before serving, microwave chocolate chips in a small, heat proof bowl in 15-30 second intervals on High, stirring between each, until melted. 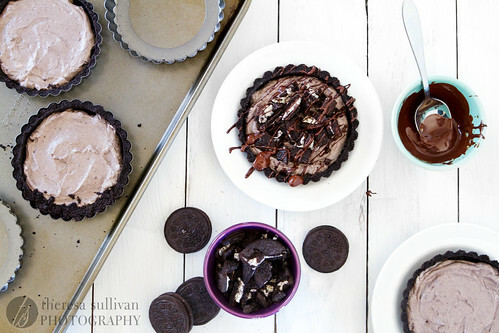 Top tarts with remaining chopped Oreos and drizzle each with melted chocolate. I couldn’t believe it when I had heard. I’m British and as far as I’m concerned oreos have only existed for the past 8-10 years… :D. What fantastic looking tartlets. This is VERY impressive indeed! Beautiful! And I’m not even an Oreo fan. Although I do like the reverse Oreos, and have you tried the peanut butter fudge ones that just came out? They taste like… Girl scout cookies! Wow…I’m going to make these! Thanks for posting! These look so good! I love how you always come up with these kinds of desserts that are simple yet look really impressive. And I bet if you used low fat yogurt and cream cheese you could make slightly healthier version that would still taste good. I always have those ingredients on hand, so I’ll definitely have to try it out next time I have some Oreos! Funny you should mention that – I made the tarts with 0% Chobani yogurt and 1/3 less fat cream cheese. They didn’t taste low fat at all! I don’t personally recommend using reduced fat Oreos though. Happy birthday, Oreo and thanks for making us a part of the celebration, Theresa. This looks good enough to whip up for any occasion. Yum! We just pinned to our Chobaniac Creations Pinterest board…drool! Could you make this same recipe but use 1 full size tart pan or would you need to adjust the amounts? That’s a good question! I haven’t tried it so I can’t say for sure. However, I have other recipes that make 4 tartlets that do scale up to one big 9-inch tart (like this one: https://cravingchronicles.com/2010/11/10/apple-cranberry-caramel-tarts/), so I think it might work. You may need to scale up the crust and filling amounts just a little. If you try it let me know how it turns out! My god these look amazing. 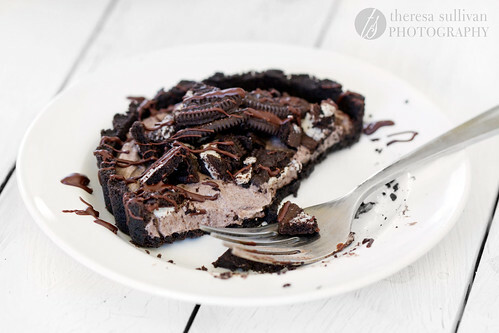 I’m Australian and slightly embarrassed to say I love Oreos so this dessert is right up my alley. Yummy! Will make them soon, LOVE oreos! This looks so yummy! And how perfect for Oreo’s 100th b-day!! oh MY this looks amazing. i love anything with oreo’s in it! I can’t remember the day i dont know or love them either! Even when the weird filling variations came out, I still loved and respected Oreo. This is a great opportunity to buy oreos then!